My first skate of the season! OK, so I'm not actually in this pic, as I was behind the cam, but I was having just as much fun as those people gliding across the ice, trying not to fall. Sadly, I’m spending the holidays here in Toronto. No, no, it’s not so bad. Spending the holidays last year in Costa Rica was divine, but as I’ve said before, I missed all the fun and family time in the Great White North while I was hiking great wild jungles in the south. But this year, we’re sorely lacking in snow here in T.O. Though it has been unseasonably warm (Toronto’s warmer than Texas and L.A.! ), that hasn’t stopped peeps from having winter fun. 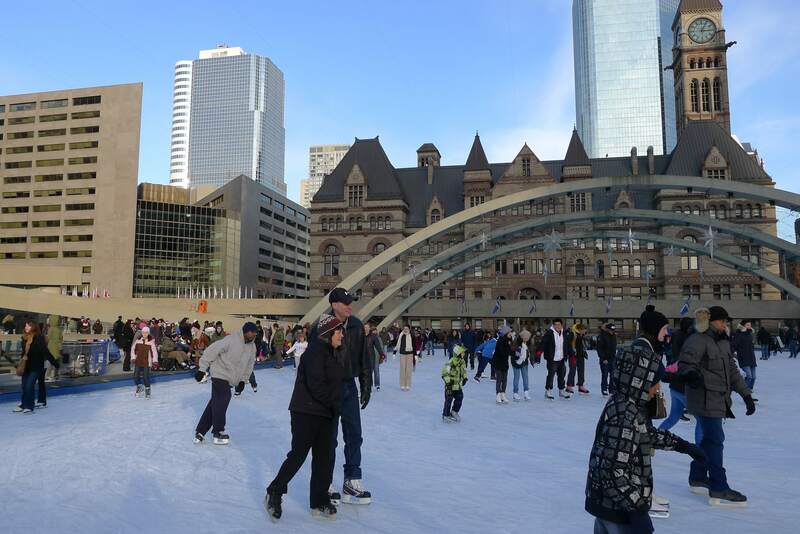 Witness the families speeding around the rink at Nathan Phillips Square this past weekend. Somewhere in that crowd is the lovely lady who nearly gave me a black eye and bloody nose when she suddenly threw her arms out, whacking me in the face as she tried to catch her balance. And, yes, I was laughing along with her, cracking a joke that I don’t really need these glasses to see…. My goal for the holidays, aside from spending as much time with my family as possible, is to hit the rink every day. By no means am I a good skater, mind you. On Saturday, I had to ask a kind gentleman to hold my hand so I could step down onto the ice! And I had a few near collisions too – as the collidee, not the collider. But it’s always a hoot to try not to fall while feigning graceful glides (in my mind, I resemble a speed skater), and watching others fall funny or make every attempt not to fall is def good for a giggle. So a-skating I will go before I head over to Kensington Market on Wednesday, Dec. 21, with my lantern in hand, ready to join the annual winter solstice parade. Winter solstice, symbolic of rebirth, marks the shortest day and longest night of the year, when the sun’s maximum elevation is at its lowest. 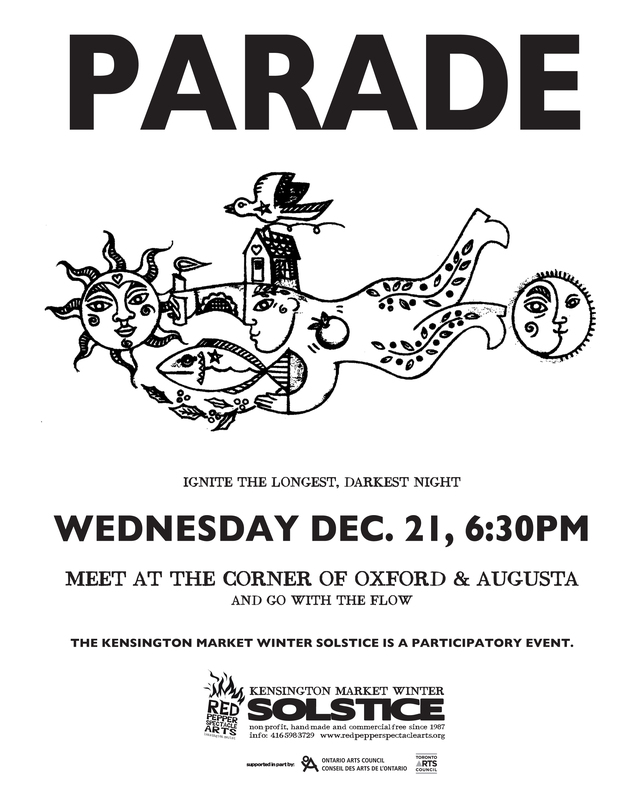 Organized by Red Pepper Spectacle Arts, the parade in Kensington is a tradition, and many participants come prepared with a lantern made at Red Pepper’s PWYC lantern-making workshop the weekend before winter solstice. Be warned, this isn’t a parade that you watch from the sidelines – the route is usually so packed and the parade moves so slow, there’s really no room for folks to merely watch. And unless you’ve snagged yourself a prime rooftop perch, it’s ever more fun to join in the parade and light up the night! Where: Toronto, Ontario, Canada. The parade starts at the corner of Oxford Street and Augusta Avenue, proceeding through the market and ending in Alexandra Park at 8 p.m. When: Wednesday, December 21, 2012, 6:30 p.m. Bonus: Bring your lanterns and noisemakers. Dress in colourful costume. Go with the flow!